Is gluten-free for everyone? Are all gluten-free products healthy? 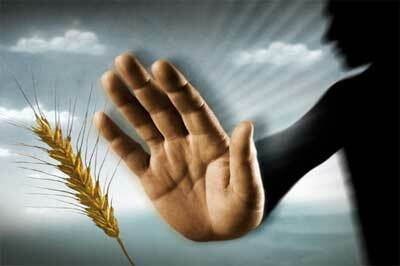 Which tests are accurate for gluten intolerance and Celiac’s Disease? Find out who needs to go gluten-free to improve health, how to find out if you need to exclude it, how to read labels to avoid gluten and which gluten-free products should still be avoided if you are trying to be healthy. I’m a big fan of easy, delicious recipes, so when one of my clients shared this one with me, I had to try it right away. And. Oh. My. Gawd. It is awesome. In a large skillet, melt coconut oil on medium heat. 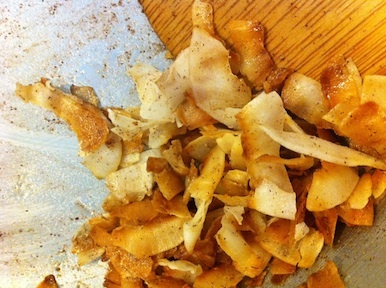 Add coconut flakes, salt, cinnamon and stevia. Stir continuously so flakes don’t burn. When they start to turn golden brown, turn off heat. I enjoy this snack as a finger food. Think of it as a lower carb, high fiber, healthy fat substitute for chips,crackers or popcorn. 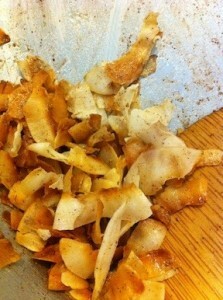 The crispy texture and mildly sweet-salty taste are satisfying…and addicting! *Special thanks to Dani for contributing this great snack! 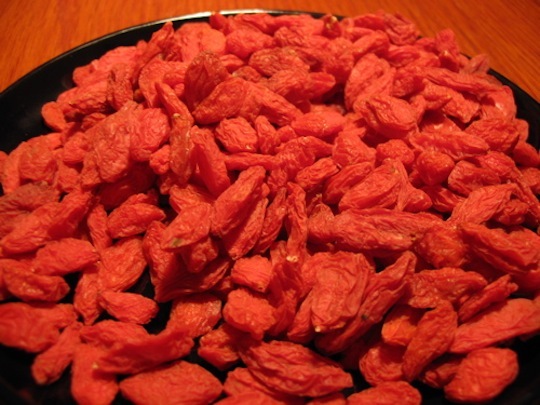 Goji berries, also called wolfberries, are a fruit native to China. Within their red-orange raisin appearance resides an impressive history of health benefits. In Tibetan medicine, goji berries or Lycium barbarum have been used for about 2,000 years to treat kidney, eye, skin, allergy, and sleep problems; diabetes; cancer; sexual dysfunction; and chronic liver disease. 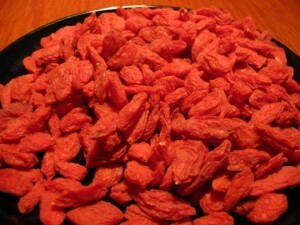 Goji berries have become very popular in the past five years. 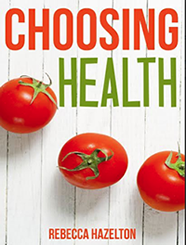 For having been around for such a long time, there is a surprising lack of quality research on many of the health claims. Still, enough of their benefits have been substantiated to earn them the “superfood” title. As to their therapeutic value, we seem to have only scratched the surface of the polysaccharide, phytochemical, carotenoid, and antioxidant properties. The goji berry is an adaptogen, a term used to describe a property in compounds that increase the body’s ability to deal with stress, trauma, fatigue and anxiety. Due to its adaptogenic nature, the goji berry is believed to aid in digestion, weight loss (stress is well known to contribute to weight gain and prevent weight loss), energy levels and heart health. Supports the endocrine glands responsible for muscle repair and generating energy, specifically the thymus, adrenal, thyroid and pituitary. Also, the polysaccharides in goji berries have been found to reduce muscle soreness by aiding the removal of lactic acid and other toxins that can build up during exercise. Low glycemic effect. Goji berries are only 29 on the Glycemic Index (anything below 50 is considered to be low glycemic), so they aren’t likely to spike blood sugar. Contains the phytochemicals Betain (assists in breaking down fats stored in liver), Zeaxanthin (protects the retinas in our eyes), Physalin (helps fight off certain cancers like leukemia), Solavetivone (powerful anti-fungal and anti-bacterial), Cyperone (lowers blood pressure and has cancer fighting properties, especially good for preventing cervical cancer), and Beta Sitoserol (anti-inflammatory and increases virility). Almost a complete protein. Many websites say that it contains “all 8 essential amino acids”, but there are actually 9 essential amino acids (still, pretty good for a berry) and contains 18 amino acids total. Two amino acids in particular, l-arginine and l-glutamine, when combined with potassium (which is also high in goji berries) help your body to produce more growth hormone. Growth hormone helps your body retain lean muscle tissue. High in fiber: They are 21% fiber by weight. Nutrient density: Ounce for ounce, goji berries have more vitamin C than oranges, four-times the potassium of bananas, more beta-carotene than carrots, more iron than spinach, are high in zinc (a mineral essential for a healthy immune system), an array of B vitamins, and the fat-soluble antioxidant vitamin E.
Supports eye health. The antioxidant zeaxanthin absorbs blue light. Strengthens the immune system and promotes friendly gut bacteria, impacting other areas of health including reducing inflammation, allergies, symptoms of autoimmunity disease, and increased cancer cell destruction. Higher in antioxidants than blueberries (5-10 times depending on who you ask). Goji berries are rated #1 on the ORAC scale (Oxygen Radical Absorbance Capacity), which measures the antioxidant level in foods. Because of their powerful ability to protect cells against free radical damage, goji berries are considered the world’s most anti-aging food. Integrating goji berries into your diet is easy! They can certainly be eaten frozen or dried by themselves, but here are some other ways to enjoy them. As with any food, some people will feel better eating goji berries than others. So even though goji berries have an impressive nutritional profile, if you notice that they don’t agree with your body (cause gas, bloating, sugar cravings, foggy thinking, increased hunger, energy tanking, etc. ), find another superfood that does. Goji berries are carried in most health food stores either packaged or in bulk. They can be pricy, but if even half of the health claims about them are true, they’re well worth it. Badges, camping, and girl bonding: These are the aspects of the Girl Scouts worth supporting. 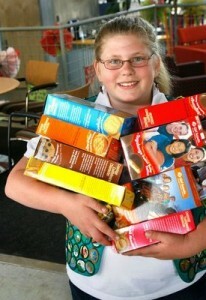 However, buying boxed cookies every year isn’t good for you or the Girl Scouts. They are unhealthy and propagate a poor example of wise food choices. Trans fats, artificial flavors, and corn syrup…Oh my! Happily using high fructose corn syrup since it is “a specifically helpful ingredient in the browning process.” Seriously. It says it right on their website. Click here to see the labels for yourself. Mixed messages these girls are getting by selling unhealthy, processed food to people while simultaneously trying to earn badges in “respecting yourself and others” (that should include health), “healthy living”, and “eating for beauty”. Now, if you are saying to yourself, “It’s no big deal, it’s only once a year, blah, blah, blah…”, remember that most people aren’t buying a single box of cookies that is in and out of the house in a week. About 200 million boxes are sold every year. It isn’t uncommon for families to buy 5 or more boxes (there are up to 28 varieties). It is possible to support the Girl Scouts while taking a stand for your health and the health of those around you. Next time you see Girl Scouts selling cookies, skip the cookies and instead, make a donation (.50 cents is equal to the profit they’d make on 1 box) along with the suggestion that they offer healthier alternatives including homemade cookies like the troops used to sell in the future. 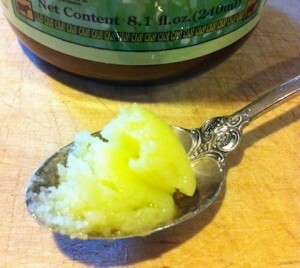 Butter oil or high-vitamin butter oil is dairy oil extracted without heat from cows fed solely rapidly growing grass. It is more nutrient dense than standard butter from grass-fed cows and less processed than ghee. According to Dr. Weston A. Price, who discovered butter oil in the 1930’s, high vitamin butter oil has its most potent health impact when combined with cod liver oil. In fact, before going to have a cavity filled by your dentist, look into the remineralization studies on cod liver oil combined with high-vitamin butter oil! Look for it in your local health food store or vitamin center. Trusted brands include Green Pastures. Keep in the refrigerator to extend shelf life. 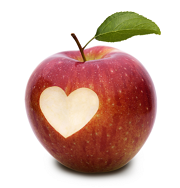 http://choosinghealthnow.com/wp-content/uploads/2016/05/apple.png 0 0 admin http://choosinghealthnow.com/wp-content/uploads/2016/05/apple.png admin2012-03-05 11:49:272012-03-05 11:49:27What is butter oil?